As a family we have been dairy farming all our lives. 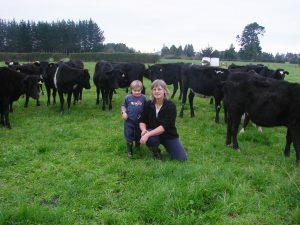 Neil and I built our herd up over time in the Waikato as we worked up through the ranks of contract milker to sharemilker and then to leasing properties. Fifteen years ago our youngest daughter left school to work on the farm and has been working with me as my ‘right-hand woman’ ever since. Janette on the farm with her grandson Ethan Perrett (3½). “Ethan has been our inspiration, having been drinking raw organic cow’s milk from an early age, and his mother has said no to vaccinations,” says Janette. I began to question how we were doing things when we farmed just outside Hamilton, nine years ago where I was drenching the cows twice a day with petroleum-based products to prevent them dying from bloat and to boost their milk production. The drench gun was leaking down my arm and I thought nothing of it until one day I could not scrub what I mistook for dirt off the underside of my arm. I had a mass of black hairs growing there! Another activity that bothered me was the number of animals that were not getting in calf and the increasing number of CIDRS (artificial devices) we needed to insert to get the cows’ breeding cycle started. Looking at the soil and being able to compare farms as we have moved around the Waikato also showed us something was going wrong. We nearly became stuck on the nitrogen (urea) treadmill where once you have applied it and the grass gets its ‘fix’, you add more the following year and still more the year after that. We witnessed our animal health problems such as milk fever, eczema, bloat, and worm infestations increasing threefold. All of the above moved us to turn back the clock. Back to how we used to farm, but now it has been named organic. 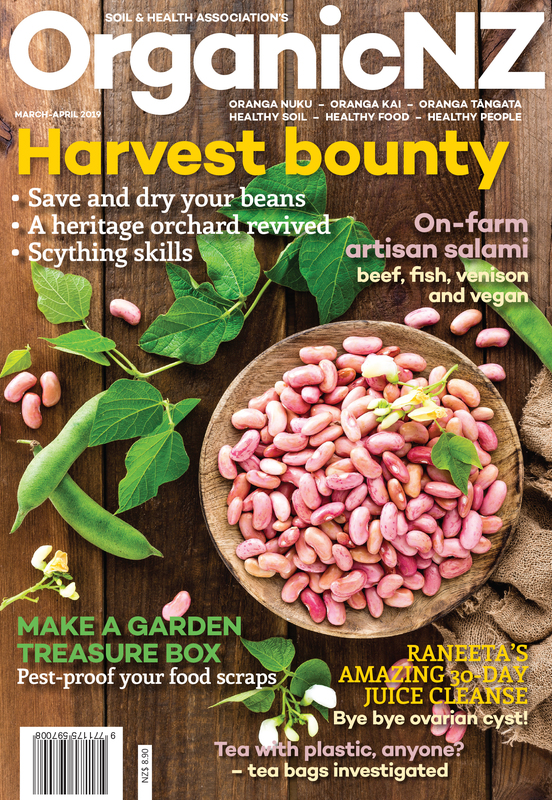 It was seven years ago when our organic conversion began, and in year two the Agriculture New Zealand Go Organic course was recommended to me (www.agnz.co.nz). I didn’t really think I would have the time and didn’t expect thecourse to be appropriate to dairy farming. I was wrong on both counts. It was so easy to give up a few hours each Friday to be amongst like-minded people and learn from such passionate tutors. The field trips took us to some amazing properties where we saw organics really working. The course showed me that a weed is not a weed, and shelter belts are not just a line of trees planted at random. I recall a full day where we listened to a beekeeper and we also had a field day to make a compost heap, which is a real art form in itself. Learning to describe our current farming systems as monocultural environments was memorable as was planning for the development of a polycultural system. I was also introduced to biodynamics, the ultimate in organics. What really opened my eyes was learning about our soils and all its inhabitants. As a farmer I should have known this. I feel we have forgotten how to farm and we no longer use our six senses: ears, eyes, smell, taste, touch and soul. This course has taught me to walk the farm smelling the soil under scotch thistles, and to taste clover, chickweed and dock leaves. I have learnt to listen to the water rushing down the streams and the cows ripping the grass. By incorporating all that I have learnt, I am amazed at how simple farming has become, and a lot less stressful. It has taken a few years for Agriculture New Zealand to put together the level four course they now offer (Applied Organics), and I have been able to attend their course in Thames with some amazing classmates. The course so far has seen us propagating plants, assessing our soil using the VSA (visual soil assessment) system, demonstrating water use relating to land usage and producing our own liquid fertiliser to name a few. It has been a fantastic course to partake in, as it has given me the confidence to introduce the lessons into our farming system and to teach others. It has been a long journey and I feel there is an even longer one ahead as there is still so much to learn. 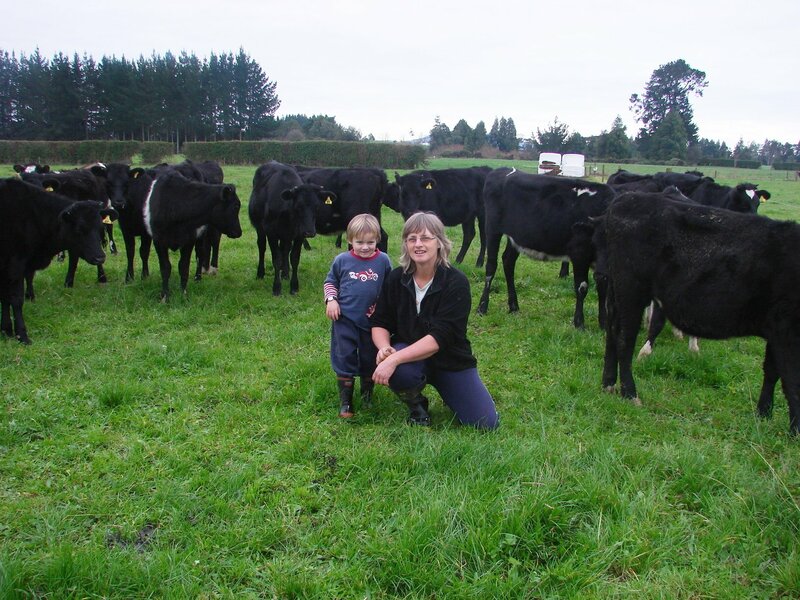 Janette Perrett farms with her daughter Carla and husband Neil near Pirongia.